Rebecca Beatrice Brooks November 25, 2018 November 30, 2018 No Comments on What Caused the War of 1812? The actual causes of the War of 1812 are difficult to determine, in part because much of the war-time propaganda obscured the true causes. That being said, most historians don’t believe there was a single cause but rather a variety of causes, some of which were official while others were unofficial. The official causes were originally listed in a message that President James Madison sent to Congress on June 1, 1812, in which he listed complaints about British behavior toward America. Continual harassment of American commerce by British warships. 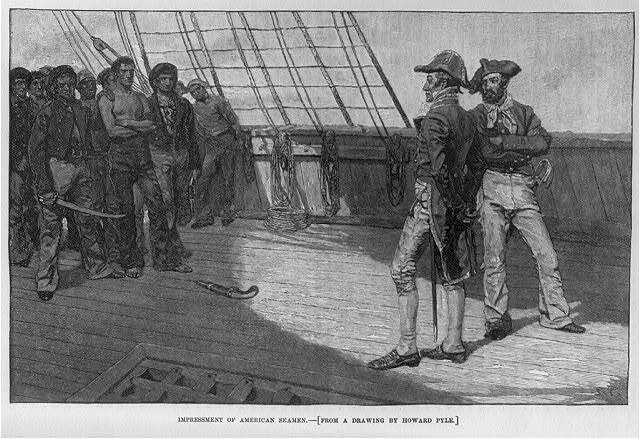 British laws, known as Orders in Council, declaring blockades against American ships bound for European ports. Attacks by Native-Americans on American frontiers believed to be instigated by British troops in Canada. The unofficial causes were never mentioned publicly and instead have been pieced together by historians over the years. Impressment is the act of forcing men into military service. Great Britain had a long history of using impressment but escalated this practice after the Napoleonic Wars began in 1803. The issue of impressment caused a public outrage in America and is believed to be one of the main causes of the War of 1812. Impressment became a popular issue in the press before it even appeared on President James Madison’s list of grievances against Britain in his June 1, 1812 message to Congress. Yet, some historians now question how much of a factor impressement really was in the build up to the war. According to an article by John P. Deeben on the National Archives website, out of the total population of 3.9 to 7.2 million Americans, the impressment of fewer than 10,000 Americans between 1789 and 1815 was rather insignificant. When the argument that British Orders in Council were infringing on American trade rights failed to ignite the public’s anger in the build up to the war, politicians began to lean even more heavily on the impressment issue. The Orders In Council in Great Britain were a series of Parliamentary Acts intended to gain control of the neutral merchant shipping trade with Europe during the 18th and 19th centuries. When the Napoleonic Wars broke out between France and Great Britain in 1803, both sides tried to prevent neutral countries, such as the United States, from trading with the other in an attempt to deprive their opponent of supplies. This decree prohibited neutral ships from carrying goods between ports within Napoleon’s empire and declared that the Royal Navy would board any ship suspected of carrying goods to French ports and confiscate the contents to sell as prizes of war. The decree stated that any nation wishing to trade with closed ports must first pay transit duties. This was followed by a second edict issued on November 11, 1807, which banned all neutral trade with any port on the European continent. On December 17, 1807, Napoleon responded with the Milan Decree, which declared that the French navy would capture all ships trading with Great Britain or its colonies and confiscate their goods. The British Orders In Council are considered one of the many causes of the War of 1812 and were listed on Madison’s list of grievances to Congress in 1812. Yet some historians, such as Alan Taylor, doubt the orders in council were a factor at all in the declaration of war. As the Orders in Council failed to ignite public outrage in the build up to the war, it became less of a focal point for Republican politicians and they instead started to focus their efforts on other issues like impressment. In reality, many historians believe the claims of Indian attacks being instigated by the British were exaggerated and were merely an excuse to conquer and annex Canada. A scene on the frontiers as practiced by the humane British and their worthy allies, illustration by William Charles, published in Philadelphia circa 1812. 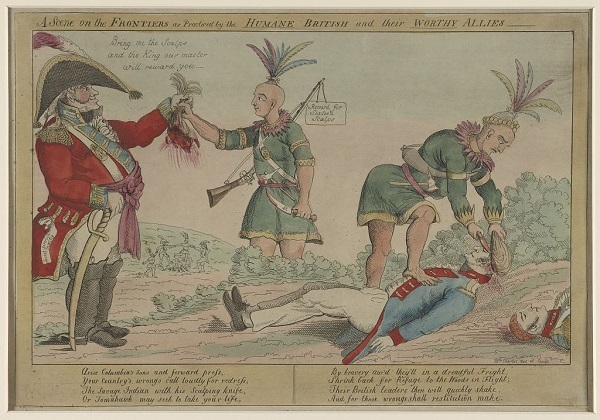 This cartoon may have been prompted by the August 1812 Native American attack on Fort Dearborn and the purchase of American scalps there by British Colonel Proctor. As Troy Bickham points out in his book, The Weight of Vengeance: The United States, The British Empire and the War of 1812, conflicts between the colonists and the American Indians, whom the British had a long-standing alliance with, were nothing new in North America and they had never been grounds for war with Britain in the past so it is unlikely they would be in 1812. American expansion into British-held Canada is considered yet another cause of the War of 1812. If America could acquire Canada, it would not only double its land mass but also banish the American Indian’s greatest allies, the British. Reginald Horsman argues, in his book The Causes of the War of 1812, that historians often quote the speeches of war hawks of the time, such as Henry Clay, Richard M. Johnson, Peter B. Porter and Felix Grundy, to support the argument that expansion was a cause of the war yet, if you examine their speeches to Congress in the build up to the war, the dominating theme of these speeches are maritime rights, particularly the right to export American produce without interference. In addition, not everyone was on board with the idea of conquering Canada at the time. Many politicians felt that acquiring and maintaining such a large amount of land wasn’t the best idea for America because it would be too expensive and difficult to manage and might lead to the creation of more northern states which would threaten the country’s regional balance of power. This idea made the conquest of Canada even less appealing though because many wondered why the government should invest so much time, money and resources into something that they were just going to give away at the end of the war. Congress even went so far as to vote on a plan to create a temporary provisional government in Canada until it could be returned to British rule in a peace treaty but the bill was defeated, with 16 opposed and 14 in favor. Even though Americans were uncertain what to do with Canada, they invaded anyway. Without a clear plan in place, Canadians were unwelcoming of American troops and viewed them as invaders rather than liberators of British rule, greatly hampering the war effort there. In his book, The Weight of Vengeance: The United States, The British Empire and the War of 1812, Troy Bickham argues that the War of 1812 was really about America asserting its independence from Great Britain once and for all. If American sovereignty was a cause for war, it’s not clear how much of a factor it was since it was never deemed an official cause and was never listed in Madison’s grievances against the British. 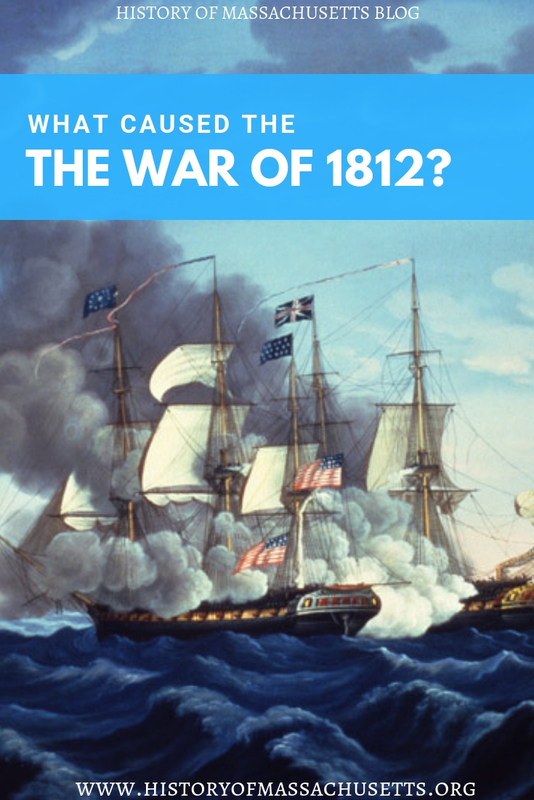 To learn more about the War of 1812, check out the following article on the Best Books About the War of 1812. Bickham, Troy. The Weight of Vengeance: The United States, The British Empire and The War of 1812. Oxford University Press, 2012. Borneman, Walter. 1812: The War That Forged a Nation. Harper Perennial, 2004. Taylor, Alan. The Civil War of 1812: American Citizens, British Subjects, Irish Rebels, & Indian Allies. Vintage Books, 2010. Brunsman, Denver. The Evil Necessity: British Naval Impressment in the Eighteenth Century Atlantic World. University of Virginia Press, 2013. Sweeney, Alastair. Fire Along the Frontier: Great Battles of the War of 1812. Dundurn Press, 2012.